What makes military Krav Maga training different from civilian Krav Maga training. All Krav Maga is the same but there are applications for different situations. With the military there are two differences. Time – The first difference is the time factor. Although all Krav Maga training is designed to allow students to gain maximum self defense proficiency in the least amount of time, in the military this is even more so. With a civilian both the time frame and the danger factor are broader. The civilian fears danger but he is not planning on entering a dangerous area at any specific time, he just wants to be prepared in general. As such, he does not have a specific time when he must be 'combat ready'. The soldier on the other hand does have a specific date when he will be 'shipped off' to Lebanon or Iraq or some other hell hole. The Civilian wants to learn as much as possible as soon as possible but he still has flexibility, he does not have to do it all in three weeks or five weeks. If it takes a little longer, that's OK. With the soldier, he only has those three or five weeks, after that he will be put back on active duty or move on to some other aspect of training. 'Captive Audience - With any commercial school half the job is keeping students/clients motivated. If they are bored they will walk away. In order to keep them interested you must keep the program 'interesting'. This often means spending too little time on techniques. Many people become impatient, "What, this again!" An instructor often finds himself needing to introduce new techniques too soon in order to keep his clients entertained, otherwise they might walk away and in that case they will learn nothing. With the military you have a captive audience. They have to be there or else they will be washing the latrines. They are yours until you are finished with them. You don't have to make it interesting. Thus you are able to drill them again and again on the basics until they get it right. 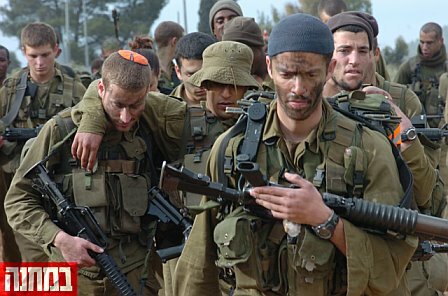 Israeli soldiers learn Krav Maga during their mandatory military service. The standing joke is "So what did you learn today in Krav Maga?" the answer, "Push ups". The military Krav Maga training will focus on a few basic techniques but the soldier will learn how to do them when he is tired, fatigued, worn out, and ready to collapse. He will run several miles and then have to pound the heavy bag. You will do push ups and then face a group of soldiers who will attack him; he will hit a punching shield while other soldiers are hitting him. He will repeat this again and again. He will not forget this training and he will learn to function in the worst possible scenarios. This is military Krav Maga, and it works. Talk to any IDF soldier, even a Krav Maga instructor; ask them how much Krav Maga they know. Most will say, "Oh, I only know the basics". It is the basics that will save you in combat.